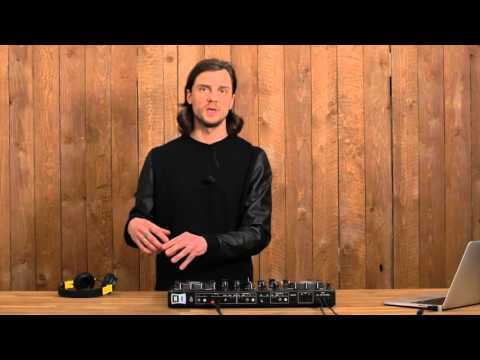 The Native Instruments Traktor Kontrol S4 MKII serves as the central hub of a Traktor DJ software setup, with an integrated 4-channel audio .. The Native Instruments Traktor Kontrol S4 MKII serves as the central hub of a Traktor DJ software setup, with an integrated 4-channel audio mixer, effects and built in Remix Slot functionality. S4 MK2 is the ideal all-in-one package for DJs who want pro features, instant usability and go-anywhere portability for the home or abroad. With the Traktor Kontrol S4 MkII, you get a 4-channel mixer section combined with a built-in 24-bit/96 kHz soundcard, an easy-to-use interface and great features. High quality analogue inputs are available with phono and mic preamps so you can connect up a number of external devices such as turntables, a CD player and more. There’s even MIDI inputs and outputs so you can easily integrate the S4 with all sorts of setups. Front loaded headphone controls mean you can easily cue up and beat match your mixes while performing. Amazingly portable, powerful and fully featured – the S4 MkII delivers an incredible performance. The Native Instruments Traktor Kontrol S4 provides you with four separate ergonomic mixer channels and each of which are equipped with 3-band EQs, filter knobs and two FX sends. To get the perfect match for your performance, the filters and EQs can be switched between TRAKTOR, Xone and other industry standard styles. Since each of these parts are individually available to you, you’ll be able to mix in ways that have never been possible before. Included with your new hardware is a copy of Traktor Pro 3 software. Built for the club, this awesome four-deck DJ software has a customisable interface and a huge range of powerful and creative tools giving you amazing freedom to DJ how your inspiration takes you. With Traktor Pro 3 officially releasing on October 18th, all new customers will receive it and any who purchased this product from August 1st 2018 onwards will get a free upgrade! Native Instruments have designed the Traktor Kontrol S4 to ensure the easiest on-the-go set preparation you’ve ever experienced. With its intuitive functionality and simple to use yet powerful features, the S4 is a great DJ system for both beginners and professional DJs. Buy the Native Instruments Traktor Kontrol S4 MkII right now at PMT Online.